The ingredients in maque choux (MOCK SHOO), a popular New Orleans dish, inspired this Scalloped Corn recipe. 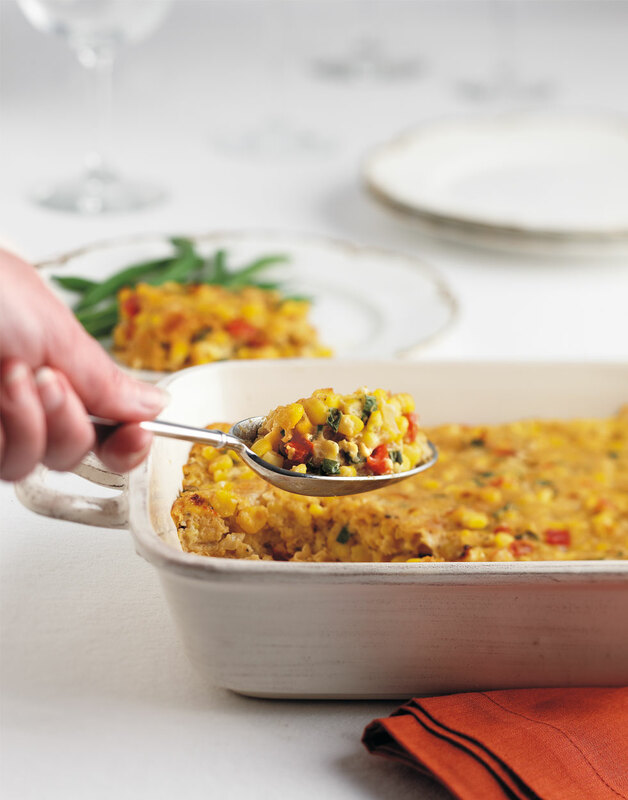 Corn, peppers, and hot sauce add a vibrant and unexpected punch of flavor to Scalloped Corn. It’s now pretty, extra creamy, and, best of all, you can do most of the work a day early. To make this dish ahead, prepare it to the point of baking, cover with plastic wrap, and pop it in the refrigerator. When ready, bake as directed. You may need to add a few extra minutes of baking time for it to thoroughly heat. Preheat oven to 350°. Coat a 1½-quart baking dish with nonstick spray. Melt butter in a sauté pan over medium heat. Add onions and bell pepper; cook until soft, about 5 minutes. Stir in corn; cook 5 minutes more. Deglaze pan with sherry; cook until liquid evaporates. Transfer corn mixture to a bowl. Whisk together eggs, milk, sugar, Tabasco, and thyme; stir into corn mixture. Add cracker crumbs and scallions; season with salt and pepper. Add the frozen corn to the sauté pan. There’s no need to thaw it. Heat from the pan will do the job. Add the cracker crumbs and stir to combine. The crumbs will help bind the ingredients and add flavor. To test the casserole for doneness, use a paring knife. If it comes out clean, the casserole is ready.